No one in Moscow should rely on oil for future prosperity with the greater availability of shale gas. Every time the oil price soars to $100 a barrel, there are voices heard in Moscow saying: “Great! We can just rely on oil and gas. The price will keep going up. We can go slow on reform.” These voices need to be resisted. Economic reform is vital for Russia’s future, whatever the current price of oil. The impact of the shale gas revolution emphatically underlines that point. It is always dangerous for any oil-rich state to rely on high oil prices to keep the economy afloat. The global oil market is capable of enormous price volatility; no state would be wise to place its budget at the mercy of the oil market. The last two years demonstrate how volatile the markets can be as we have seen oil prices as high as $148 a barrel and as low as $30 a barrel. Thankfully, one of the major Russian economic reform measures instituted early last decade was the creation of the oil stabilization fund and the more recent national welfare fund, which gives Russia some protection against market fluctuation. Even with such protection, however, the Russian economy has suffered significant economic damage from oil price swings. The instability has also caused a series of budgetary problems for the government. Until recently, the complacent Moscow observer of global oil markets had a powerful argument on his side: China. The argument went like this: Chinese economic growth created a powerful structural upward lift in demand which would forever transform global oil markets. Clearly there would still be recessions that would take global oil prices down but the trend was upward. Oil prices at $100-a-barrel-plus was the future. That China argument now looks a lot less compelling. The deployment of shale gas technology across the planet is opening up a colossal fossil fuel resource base. Each month, more exploratory drill results become available from all over the world, from Argentina to China to Australia to Indonesia. The global shale gas resources base is already several orders of magnitude greater than the Russian conventional gas reserve base of 47 trillion cubic meters. From his dacha, the complacent Moscow-based observer may say: “Ok, its gas, it’s a problem for Gazprom-we just pump more oil.” The difficulty with this view is that it does not take into account of the availability of gas-to-liquid technology (GTL). A GTL plant converts gas to petroleum and other liquids. Over the last two decades, the leading proponents of gas to liquid technology, Shell and Sasol, have made huge strides in cost reduction and efficiency. Shell is now just completing the world’s largest GTL plant in Qatar with the capacity to produce approximately 140,000 barrels per day. With far greater gas liquidity across the planet and lower gas prices due to shale gas the economic incentive to deploy GTL technology is substantial. Why sell low priced gas when you can covert it to liquids and sell it to compete with high priced oil? The real danger for oil-reliant economies is that as these shale gas deposits begin to be explored, the compelling commercial incentive to generate greater revenues from deploying GTL will become irresistible. That incentive is reinforced by national energy security concerns. Both China and the United States take a very hard national security view of energy security. Securing oil resources to run their economies and militaries is very high on the priority list for both states. As both now have significant shale gas resources, the incentive to build a couple of major GTL plants and use shale as a gas feedstock is very powerful. The incentives are probably most compelling in places like Alaska, which has vast conventional and shale gas resources but no American market, now that the lower 48 are awash in shale gas. An Alaskan GTL plant could make profitable use of that vast gas feedstock by turning gas that nobody wants into valuable, easily transportable, petroleum liquids. In addition, the Pentagon would be happy since a U.S.-based GTL plant could provide a major addition to American energy security. 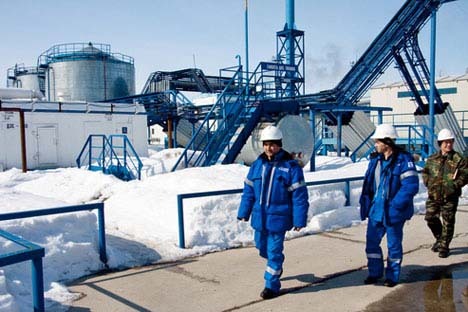 Even Gazprom may be tempted to join in GTL production. Faced with permanently low gas prices Gazprom could well scrap South Stream and spend the cash on a GTL plant near some of Russia’s own shale gas fields, generating significantly higher prices for its gas as oil. Russia is not going to be suddenly hit with a wave of cheap GTL-sourced oil over the next year. It takes several years to bring a GTL plant online. In addition, GTL plants tend to be profitable at upward of $60 a barrel. However, the medium-term economic and national security incentives to establish GTL are compelling. There is a very strong likelihood that by 2020 a number of GTL plants will be coming online, providing an alternative source of fuel liquids that can replace traditionally sourced oil. Greater sources of supply from GTL, greater energy efficiency and new energy technology are likely to offset the “China effect” on the oil price toward the end of this decade. Rather than slowing reform Russia needs to really come to grips with economic modernization before the oil revenues dwindle.